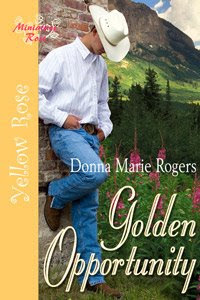 FOX & HOUND, "Outstanding Read"
As Donna's CP, I can vouch for her stories, too. Great reads! Pick up a copy as soon as they're out. :) Well, I can't vouch for the erotica ones, however, I have read the MANY great reviews she's gotten on them. Hi Ladies, thanks for posting! Amber, I'm rushing to beat the storm, so if I don't make it to Sylvia Kaye's blog this afternoon, I will when the storms pass. Stacey, thanks for posting, I'm glad everyone likes the choc. zucchini bread. My zucchini in the garden are almost big enough for the first batch of the year! I have read Game On, and it was hot. Fanning myself at the memory and grinning like a sap. 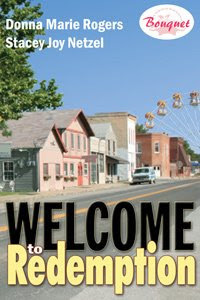 I've read Welcome to Redemption, and loved the stories you wrote as well as Stacey's. I can hardly wait to read Golden Opportunity. It sounds great. I'm not really the anonymous type but that's the only way I can get on! The internet hates me! I echo everything Amber said. All your work is so visual I see movies and TV in your future!!! And I knew you when! Woo Hoo girlfriend. Looks like two more tasty treats coming my way...oh I was referring to the books. the no calorie but still so satifying indulgence. Congratulations on your success and I wish you the absolute best in your uncoming releases. Hmm, I just tried to post a long comment, but blogger ate it--naughty blogger! Loved the interview, and I love the brooding cowboy cover--and I'm not even usually a cowboy person. LOL on "learning to share" after writing menages as Liza (snorting iced tea all over my keyboard here).